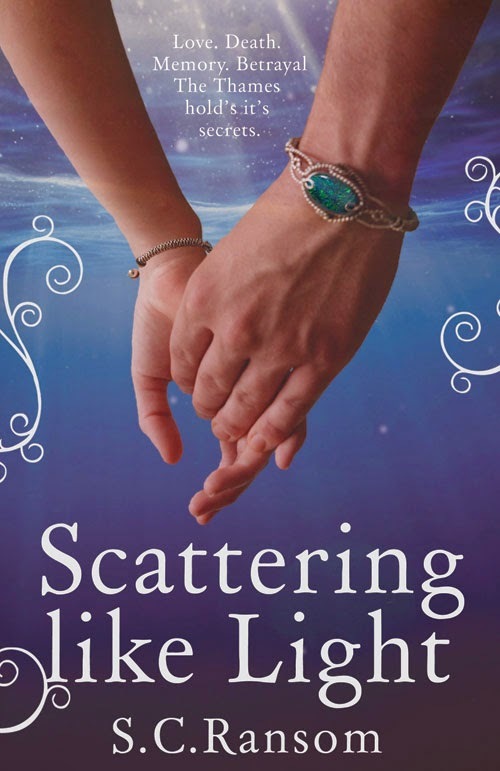 Today on the blog, I am pleased to welcome UKYA author, S.C. 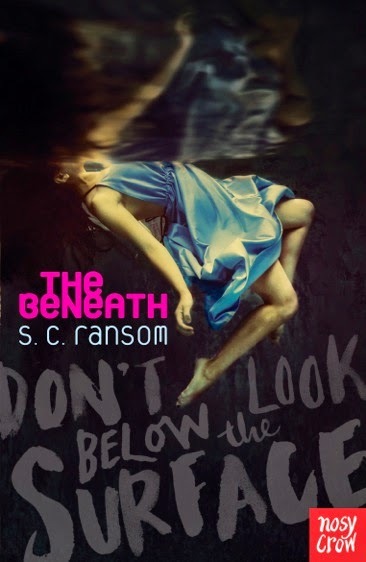 Ransom onto the blog to talk about her book cycle. S.C. 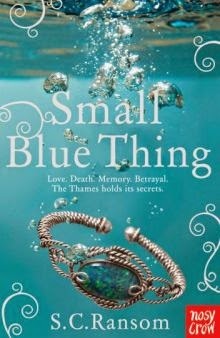 Ransom is the author of the fantastic Small Blue Thing trilogy. Her latest book is called The Beneath. When it comes to writing my books I’m firmly in the planning camp. I jot down ideas all the time, and then find I’ll be coming back to one more than the others. I’ll start jotting down notes on how the story could work, and generally I then sketch the story out longhand in one of my many notebooks. If it still looks as if it might be a goer (and plenty fall over at that point), I’ll start to draft out a chapter plan. 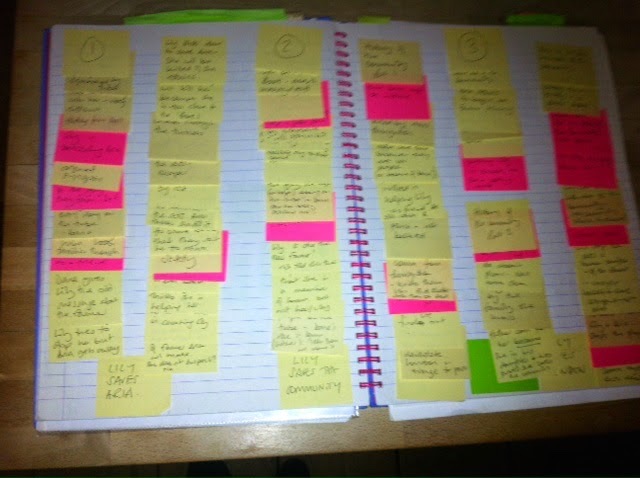 I really like having a chapter plan – it gives me structure and signposts, even if I then end up ignoring half of it. Usually, though, the beginning and the end will be written down, and won’t change much. 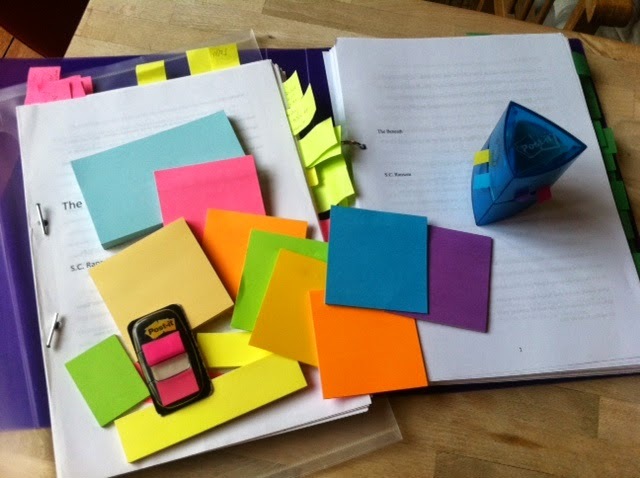 When I was writing The Beneath I toyed with the idea of making it a trilogy, and mapped out the whole thing with colour-coded post-it notes. It was really useful in being able to restructure and see if the bits with the other characters were reasonably spaced or not. In the end though we decided to make it a standalone book, so all that plot got viciously pared down. I’ve never been taught how to write a novel, so I just go by instinct – my plan allows me to make sure I have something exciting to grip the readers in the first chapter, then character development. There need to be big events in each third of the book, and I like to try to leave each chapter at a point which will make people want to carry on reading (even if it is bedtime!). When I’m thinking about my characters, I usually only have a rough idea about them when I start, and we tend to discover each other as the book develops. If I’m being organised I’ll keep notes in separate file on nuances for each character, but usually I’m not, so I can find that I’m contradicting myself a few chapters further on. It drives my editor mad! One piece of advice I was given when I was revising the original draft of Small Blue Thing for publication was that, if you’ve invented a world, make sure you make a list of the rules, and make sure everything follows them. This was really helpful, especially when writing a trilogy. 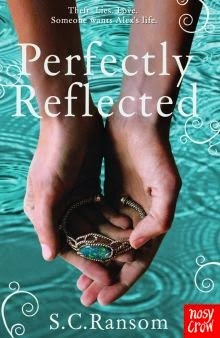 In those books, the heroine, Alex, finds a bracelet which allows her to communicate with drowned souls. To make the whole thing believable, the method of that communication and how the dead behave had to be consistent. I wrote a long list and found that I returned to it frequently. So once I have my chapter plan, an idea of my cast and the world in which they live, I start to write. Usually I start at the beginning, but the beauty of having a chapter plan means that I don’t have to. 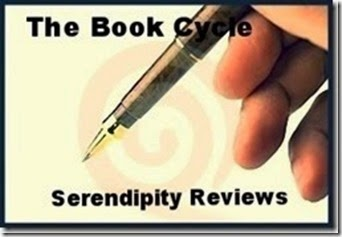 I generally have about 20-25 chapters, each of 2,500-3,000 words – up to about ten pages. Something exciting or revealing has to happen in each chapter. I try and write this first draft as quickly as I can, without getting too sidetracked into details and research. The internet is a terrible distraction to writing time, so I tend to leave my self notes in the text –‘more stuff about X in here’. 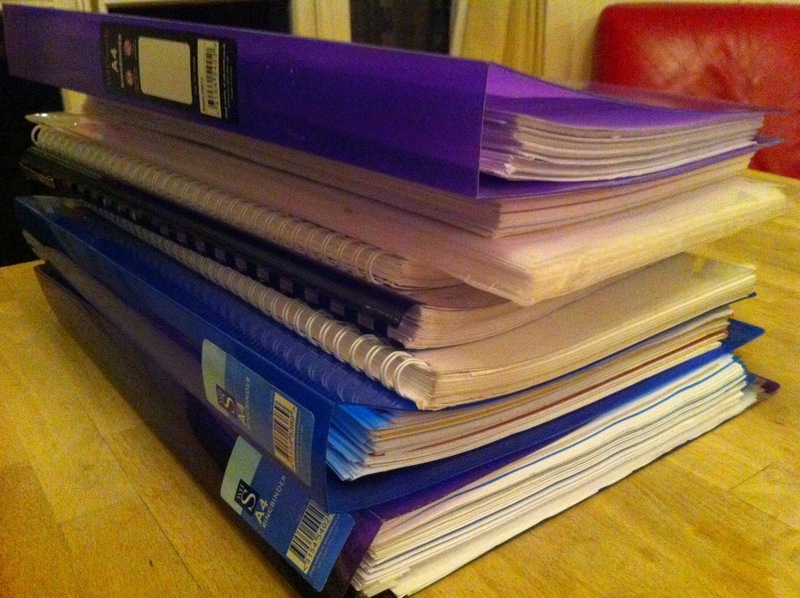 Once I’ve written a draft I print it out and put it in a folder. It makes it seem much more real to me to have it in a form I can actually hold. Then I’ll read it through and revise it in pencil, writing great wodges of stuff in the margins which I struggle to read back later as I type it in. A new draft gets a new subfolder on my computer. I keep all drafts – electronic and physical, and I’m running out of space. I just love to see the evolution of the story. Depending on when the publisher wants to see it, I might send an early draft or one which has been through a few more revisions. At this point I can go a bit wild with the different types of post-it. the editor then gets back to me with comments. The first pass will be the big stuff, and I probably won’t get a file back from them but just a long email with thoughts. I then do another draft, possibly two, before we start on the actual editing. She’ll send me one enormous file, usually covered in red revisions, which can be a bit daunting. The annoying thing about editors, though, is that they are almost always right, and however much I might rant at the proposed changes, I usually make them. There are various levels of edit, and after each major one I’ll print out another version to see how it reads. The Beneath has six or seven files of different drafts, and it’s lovely to line them up on the shelf behind the finished copies. Thank you, Sue, for telling us all about your writing process. I am impressed by all those printed drafts! Thanks Olivia - I hope that you like it!